Review: Shane Bissett's "This time tomorrow" starring Jade Elysan and Dave Coleman. - Films de Lover, films d'amour et comédies romantiques. I already stated that the development of Video on demand platforms is a tremendous chance for viewers from all over the world, especially in France where we do no get the chance to see a lot of independent romance films. Thanks to one of those platforms, I stumbled upon "This time tomorrow" that is available for rental at the minimal price of 1$. What a bargain. The synopsis is great, the scene shown as a trailer is enjoyable and I then found myself buying the film altogether from the official website. Kind of a leap of faith, right? I have faith in indie filmmakers to come up with intelligent, smart and funny romance films. The great things about romance films is that they don't need a big budget. They just need a great script, two fine actors, a great director and a dedicated crew. That's all. No more, no less. Luckily, "This time tomorrow" has got it all. As I said, I was right away attracted to the synopsis of the film that plays on the supposed end of the world on the 21th of December 2012 to tell a story of love, regrets and destiny. There is a definite "Before sunrise"-esque vibe going on from the start and it will never go away. There are worse references when it comes to romance movies, don't you agree? As its glorious parent, "This time tomorrow" is a film that talks a lot, about pretty much everything. About life of course, regrets about relationships, things that could have been, things that were and things that are, all in a 24h-day set in Philadelphia. The end-of-the-world background is an excellent way to anchor the story in a very interesting dynamic that I found enthralling. 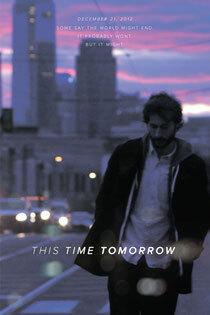 Let's be honest, "This time tomorrow" is a film made with no money, in the purest form of mumblecore movies, shot in 5 days but it never looks cheap. The shots are beautifully made, settings are great and the scenes and dialogues feel genuine. What matters here are the characters and the story they want to tell. Dave Coleman is great as a man lost in his life after an incomplete (and brutal) break-up with his girlfriend played by the fantastic Jade Elysan. The fact that they are not-recognizable faces (yet) makes the story credible, as if the director really was there, hiding in the streets filming them. There are classic scenes from romance movies, like the bicycle scene, the beach scene but it never seems formulaic. The music as well is a great achievement and it is a bit of a shame that it's not available anywhere on the web. There's magic in this tiny film that manages to encapsulate in 80 minutes what makes a relationship work or not, that makes us look back on what we did to be able to go forward. I have a problem with the ending that is not really ok from my point of view but totally in line with the film. Mayans predicted the end of one world on December 21st, 2012 and the beginning of a new one and that's precisely what shows the film. Some may like it, others won't but in the end, it is well worth your time and money. Synopsis:Some people believe that the world might end on December 21st, 2012. Stacey, a self-defeating romanticist, is not quite sure. Though it seems unlikely, Stacey decides that if this is the last day, he wants to share it with his former girlfriend, Parker. Despite their complicated history, he convinces her to forget their past and embrace the idea of spending just one last day together. Available for $1 on Vimeo on Demand and for the price you want in DVD/Download on the official website.